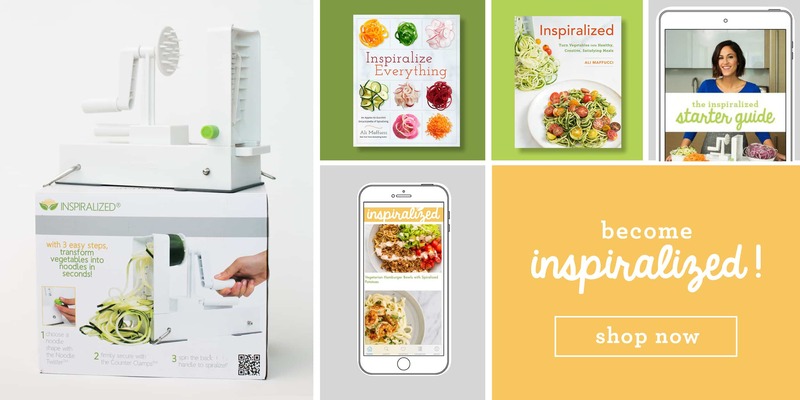 I’ve created quite the buzz with my cantaloupe spiralizing! I love seeing everyone’s excitement when they discover a new vegetable (or fruit!) 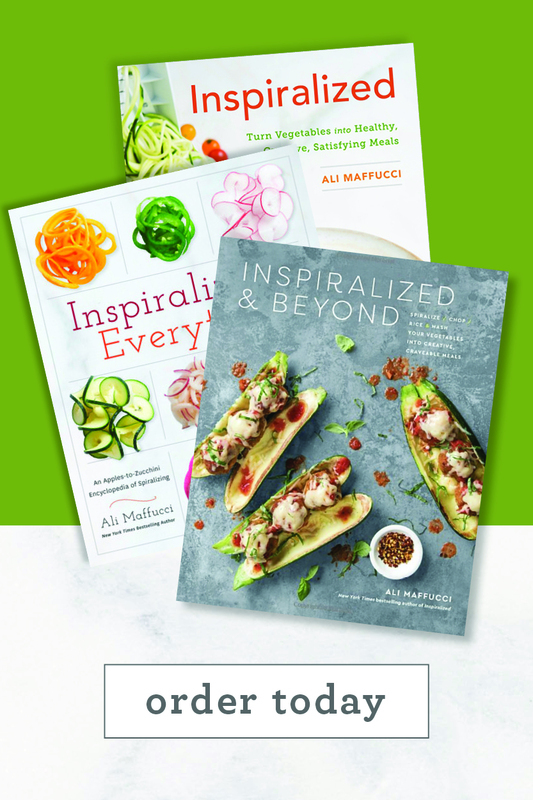 that can be spiralized – it opens a whole new world of spiralized possibilities, like here, with the cantaloupe. Spiralizing cantaloupe is possible (did you see last week’s post on spiralizing cantaloupe?) 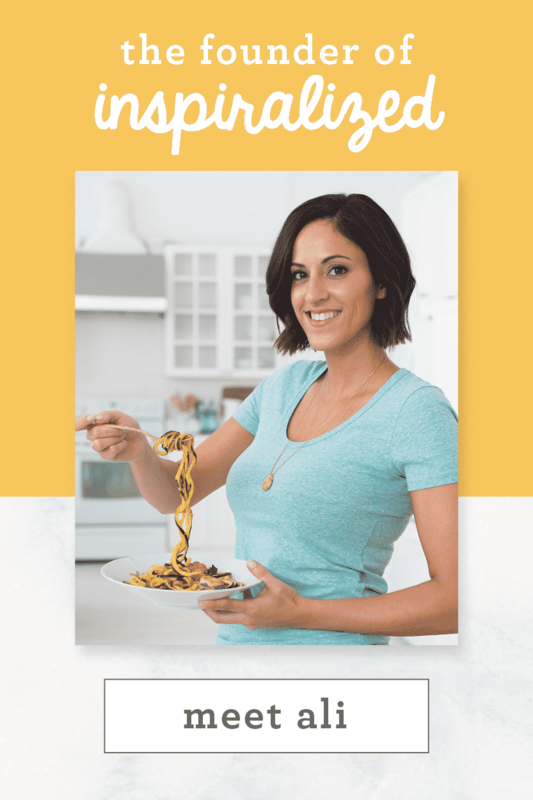 and today, I’m sharing a very delicious way to serve it and enjoy it as a noodle! 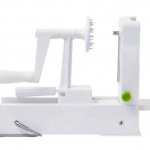 You want to spiralize a ripe cantaloupe – but make sure it’s not too ripe! If it’s super squishy, the noodles will be mushy. Just like you would buy any cantaloupe, press firmly on the outside and if your fingers make indents easily, it’s definitely over-ripe. If there’s a little give but it’s mostly firm, that’s a good one! So what do you do with your spiralized cantaloupe? Try a spin on a fruit salad! Make this quinoa and walnut salad. 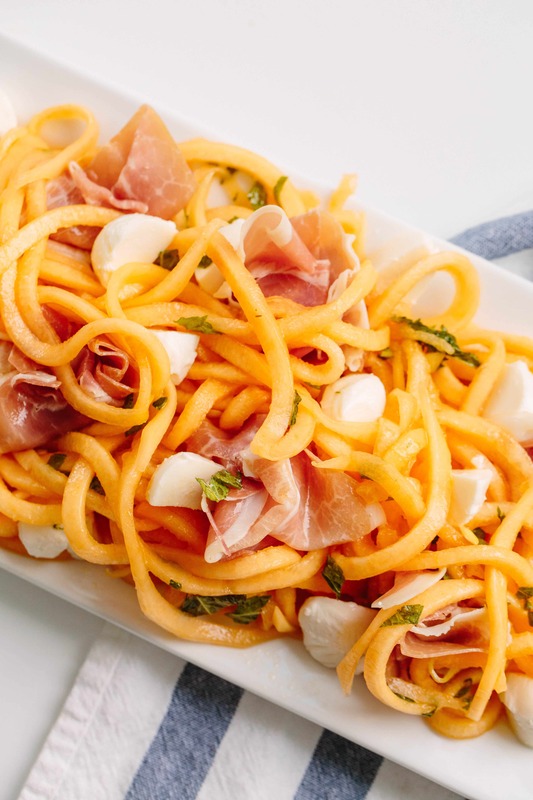 OR, make something perfect for sharing and feeding a crowd – or just yourself – like today’s spiralized cantaloupe and prosciutto salad. 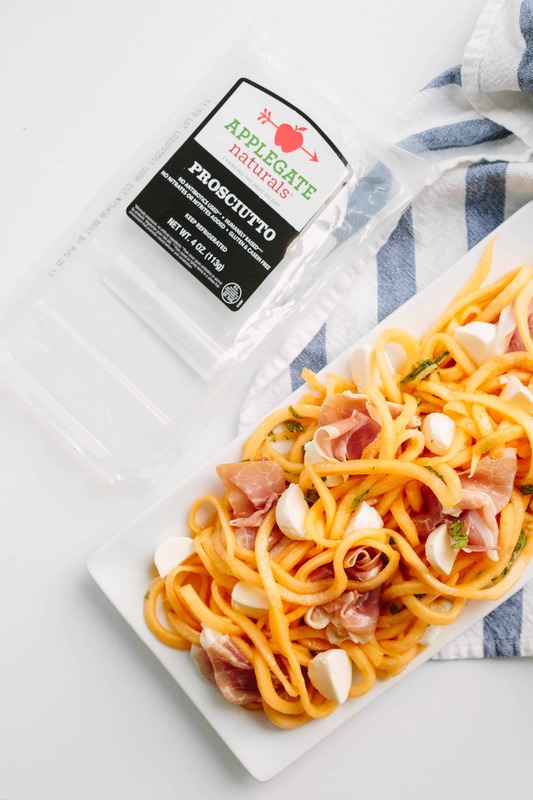 The cantaloupe is tossed together with an easy mint-lime dressing that’s lightly sweetened with honey and then served with Applegate natural prosciutto and quartered mozzarella balls. I love using Applegate’s deli slices and meats, because I know there’s no added junk in there (like GMOs or antiobiotics), which is especially important when you’re shopping for meat products. 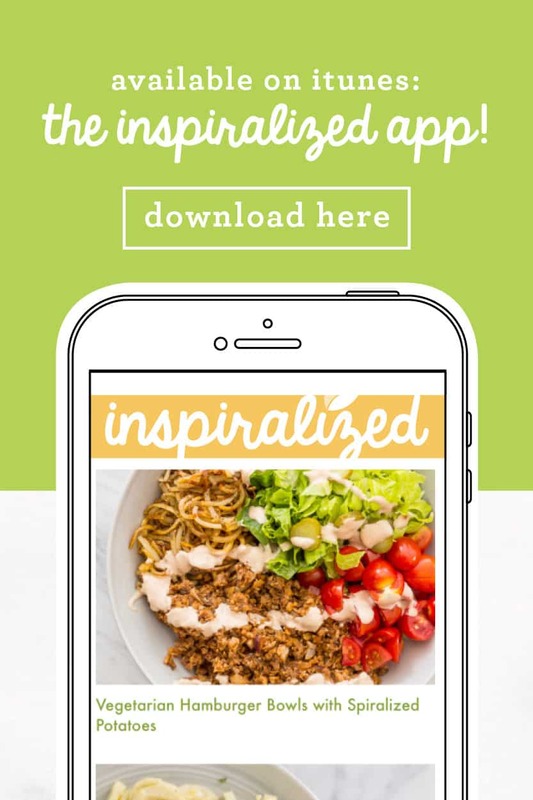 Applegate has a great mission to inspire people to talk about where their food comes from and the impact it has on the environment, which I can really stand behind and feel proud of at the check out line. 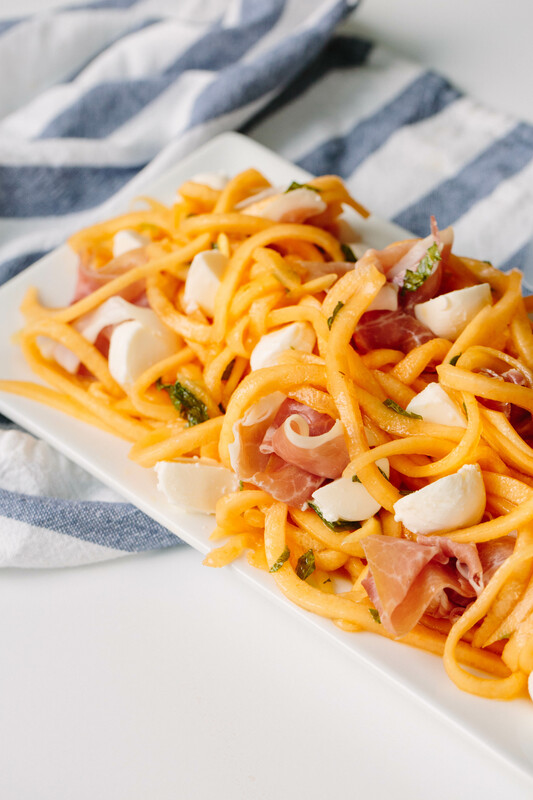 Prosciutto and cantaloupe go together like peanut butter and jelly, so the moment I started spiralizing cantaloupe, I knew this was how I’d have to serve it. Your guests will be so impressed by your creativity – and your meat and cheese spread will never look better! Disclaimer: This post was sponsored by Applegate. However, all opinions are my own, always. Note: I am currently on vacation in Hawaii and trying my best not to work while I’m away and enjoy the relaxation time. Meaghan will be moderating all blog comments, but if you’d like to follow along on my trip adventures, follow on Instagram. In the bottom of a large mixing bowl, whisk together the olive oil, lime juice, honey, mint and season with salt and pepper. 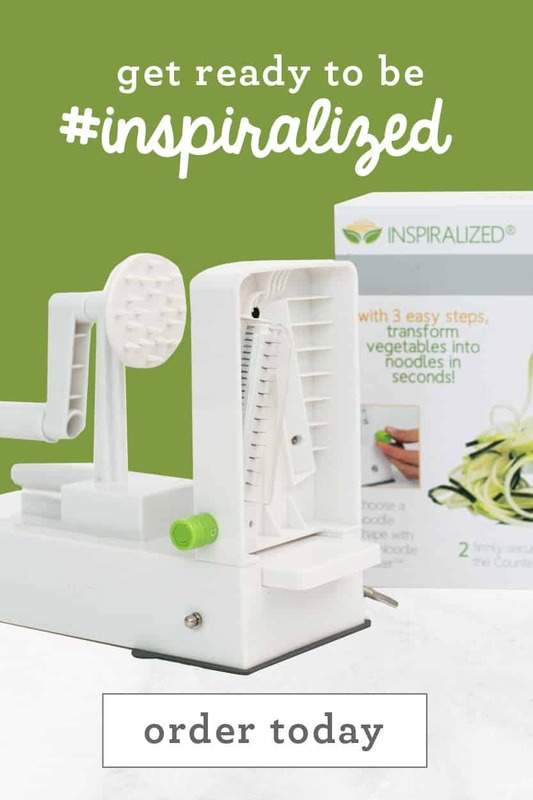 Set your Inspiralizer to Blade C. Load the cantaloupe onto the Inspiralizer and spiralizer until you start hitting the seeded interior. Scoop out the seeds and continue spiralizing until you yield about 4-5 cups of noodles. 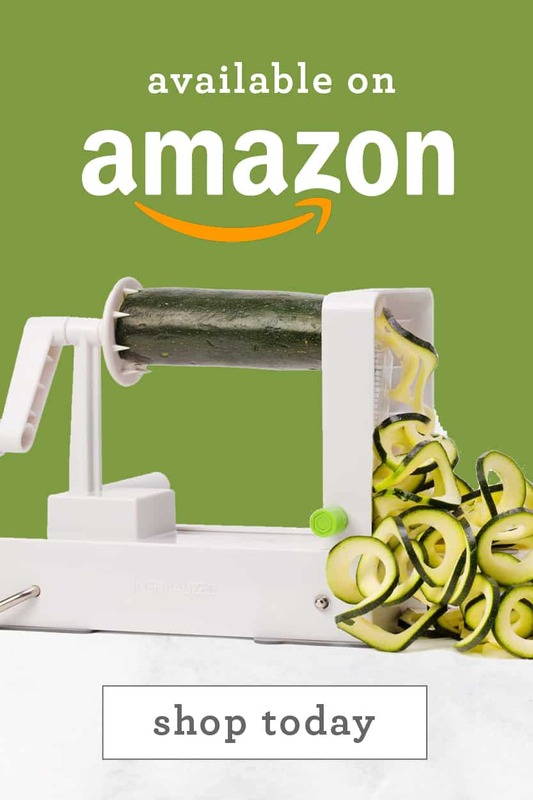 You can keep going and save the excess for future use or you can stop spiralizing, cube the cantaloupe (or keep whole) and save for future use. Add the cantaloupe noodles to the bowl along with the mozzarella and toss well to combine. Plate the cantaloupe salad on a serving platter and add in the prosciutto. Serve. Wow, I am so excited to try this! I'd eat this any time of day, but this looks like it'd make for a great breakfast to bring to work. Definitely something a little different. :-) And Applegate is the best! I don't buy bacon and packaged meats too often, but I always go with them because I trust what the ingredients are. 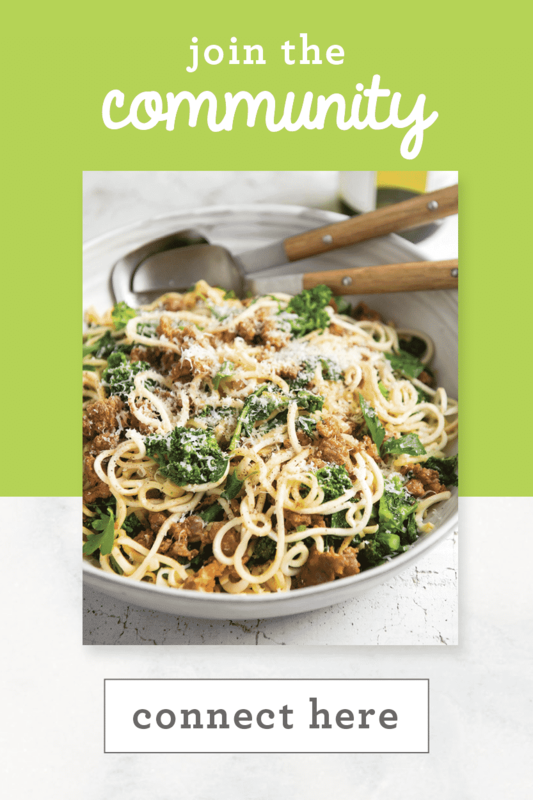 We love them and we're so happy you're going to give this recipe a shot! It's so tasty! Yes! Please do! We'd love to see! Just had cantaloupe with prosciutto together for the first time the other week -- it was absolutely amazing! Eager to try this! THANK YOU!!! You're going to love this then! Definitely beware the overripe melon. Also would suggest salting to taste when you eat it. Between my overripe melon and the salt I ended up with a puddle of juice. Also substituted basil for mint because that is what I had. Added a nice Italian twist. Very tasty. Will try again. 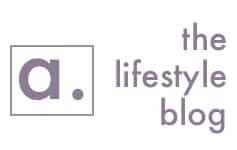 Great tips and we're so glad you used some substitutes to suit your taste! That sounds great. What is the recommended juice for this recipe? The written instructions call for lemon juice and the video shows lime juice. Thanks for catching that! We recommend lime juice! The recipe has been updated. Made it for a special visitor and it was a big hit - my cantaloupe was ripe, so I ended up blotting the excess juice with a paper towel prior to tossing with the other ingredients. I followed PJs tip and used basil instead o mint - what a great recipe! Brillant! Original and so clever. I am really jealous that I didn't think of this! Thank you Tina! Try it and let us know how it turns out! What type of cantaloupe you use. I tried this recipe twice and both times the cantaloupe was absolute mush! It looked nothing at all like your photos.